Che ck out these two pictures...they're images of the new Federal Reserve Chairman, Ben Bernanke, sworn in yesterday to replace Alan Greenspan who has finished his 14 year term. 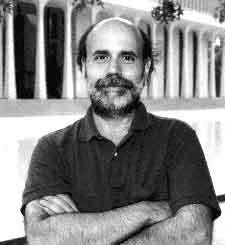 The picture on the left of Bernanke is from his Princeton web page, the one below is his Federal Reserve bio picture from the Federal Reserve website. He looks like an Economic teacher to me in the picture on the left...I bet if it was a full body picture he'd be wearing white tennis shoes, white socks and old khaki pants...but he cleaned up okay for the federal reserve, but I bet he prefers his white tennis shoes. 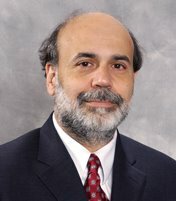 According to Inc. magazine Bernanke is setting an explicit inflation goal and de-emphasizing the consumer-price index. He also promises to make recommendations on taxes and spending proposals as Greenspan did with Bush's tax cuts.